Transportation of petroleum products from the country’s fifth biggest refinery, located at Phulokhari village in Bathinda, has been severely affected because of a two-month-old dispute between two groups of truck operators. The dispute led to a clash between the two groups outside Guru Gobind Singh Refinery on Thursday in which six trucks were damaged. Since then, about two dozen trucks have been showing up at the refinery. Normally, 300 trucks lift petroleum products daily. With space for storing petro products running out fast, production at the refinery could be hit in the near future if the dispute continues, a reliable source in the refinery has said. “The refinery may even think of reducing production,” the source added. The refinery pays more than Rs 1,000 crore in VAT every year to the state government. When contacted, the refinery’s corporate communications head, Pankaj Vinayak, said they had taken up the issue with the district administration. “The tussle has transportation of products from the refinery. Stocks are piling up, and this is causing a lot of problems to us,” he said. Bathinda police have not yet received any complaint regarding Thursday’s violence. SSP Swapan Sharma confirmed that two groups of truck operators had a fight on Thursday. “But nobody has filed a complaint regarding it,” he said. Bathinda DC Basant Garg said that after the refinery approached him, he had written to the SSP to deploy force near it to ensure nobody harasses any transporters taking up loading job at the refinery. “We have taken corrective action,” he said. One of the private transporters, Sandeep Singh, said many of them had been working with the refinery for over two years. “On Thursday night, the activists of the Rama Mandi truck union damaged more than half a dozen trucks and forced us from not taking the job of loading,” he said, claiming that the truck union was supported by senior Akali leaders. The president of the Rama Mandi truck operators’ union, Rampal Singh, denied the charge and said they had never stopped anyone from loading products from the refinery. Following the violence on Thursday, most truck operators have stopped working. Private transporters have alleged that the office bearers of a truck operators’ union of Rama Mandi town, supported by Akali leaders, had been demanding the “goonda tax”. The refinery authorities have taken up the matter with district administration, and the Bathinda deputy commissioner has written to the SSP to ensure that no one takes law into his hands. 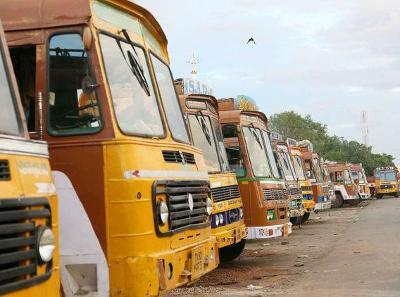 The president of the Rama Mandi truck operators’ union, Rampal Singh, denied the charge.